Is Your Red Sea Reefer XXL up to the Challenge? This dual 3/4in Random Flow Generator Kit is truly the Ultimate Red Sea Reefer Return Line Upgrade, but you’ll want to make sure your system is up to the challenge. To effectively drive the pair of 3/4in RFG nozzles, you want to supply them with a minimum of 400-500 GPH to the return line, after head loss. To really get things moving we suggest an optimal GPH of 700-800 or more. We also suggest this kit for the Reefer XXL625 and above. Anything smaller and the 1/2in Ultimate Red Sea Reefer Return Line Kit may be the better way to go. The Ultimate XXL Reefer Return Line Upgrade! The The Ultimate Reefer Return Line Upgrade Kit is the easiest way to upgrade your Red Sea Reefer return line. This kit brings together all the parts you need to transform the return line in a way no other kit can. 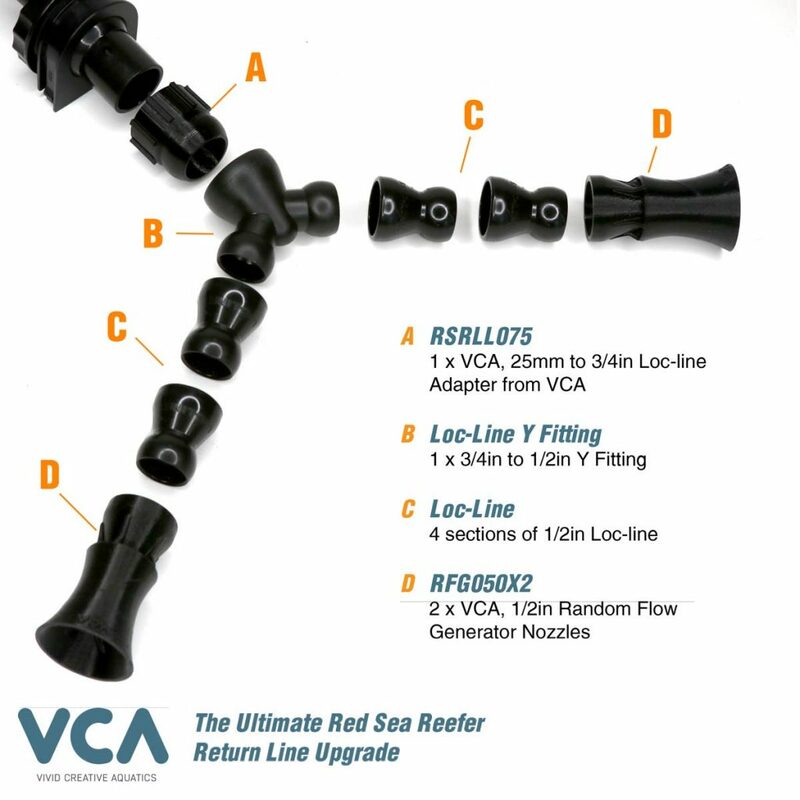 The RSRFK050 includes the VCA 25mm to 3/4in Slip-fit Loc-line Adapter, a loc-line Y fitting, a few sections of Loc-Line and two Random Flow Generators. The kit comes fully assembled and easily slips on to the end of the stock return nozzles – not tape, not tools, no glue required. It’s that easy and can completely transform your return line flow.